This does not give the water loss control that either the Pure Blanket or the Mixed Blanket techniques do because they assure proper placement of the Granular Sodium Bentonite. However, the Sprinkle Method is the best way to control water loss when it is not practical to drain the area to be treated. As with the Pure Blanket Method and the Mixed Blanket Method, first you need to determine the sq. ft. of the area you want to seal and the type of soil you will be working with. Then flag the area either with flagged markers, upright colored cones, etc. to be sure of covering the designated area with our granular Bentonite, at the recommended amount per square foot according to the size of your pond, lake, reservoir, etc. The size and slope of your pond will determine the type of equipment you can use to do this type of distribution. 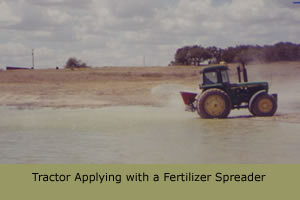 In some instances, you can use a mechanical dry fertilizer spreader, which works off the P.T.O. of a tractor and get an even distribution. When this is not possible, then you can use floating devices, (flat bottom boats, working barges, floating docks, etc.) with hoppers to get an even distribution of the Granular Sodium Bentonite on top of the water's surface. Our Granular Bentonite goes in on top of the water and sinks to the bottom of the water. One of the main reasons that the Sprinkle Method may not give the water loss control that either the Pure Blanket or the Mixed Blanket techniques do, is because we do not always know what is on the bottom of the pond. Some ponds have old tires, cedar or pine Christmas trees at the bottom for fish to spawn. Some ponds have large rocks, logs, trees, moss, and / or vegetation. All of these factors need to be considered. If the bottom of the pond is cleared of all trash and debris, then the success rate of the Sprinkle Method is much greater. Applying the Sodium Bentonite at a consistent rate insures a good cover. The Sodium Bentonite granules will fall to the bottom of the pond where it begins absorbing the water and starts to swell. It then goes into a gel that sticks to the bottom or sides of the pond, depending on where it was applied. A percentage of this gel will follow the flow of the water to help seek out the cracks an crevices where seepage occurs. However, you must apply the recommended amount of Sodium Bentonite to insure that there is enough to form a solid layer liner over the area you want to seal. The effectiveness of this Method depends upon accurately pinpointing the areas of seepage and applying the Sodium Bentonite to these spots. If you are not sure where the leaks are located or you have a very porous soil type, then you may need to treat the whole area for best results. During application a light cloudiness of the water may occur. 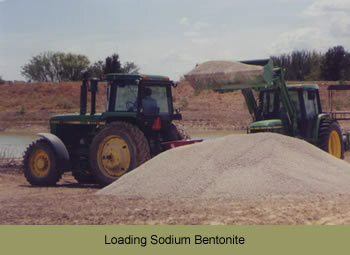 However, the cloudiness will clear within a few days as the sodium bentonite begins to hydrate and settle in the pond. Effectiveness of this Method usually occurs 60 - 90 days after treatment. For faster, ideal results, but not mandatory, we recommend the water level be maintained if at all possible, equal to the height of the Bentonite distribution for 30 - 60 days to allow the Sodium Bentonite to become fully hydrated. In all methods of Sodium Bentonite application, it's the swelling of the particles that stop the leak. Sodium Bentonite will not stop the leak immediately. Some seepage is to be expected for up to 60 and 90 days after the Sodium Bentonite is applied. Generally, the leak is stopped or at least slowed within 45 days, but due to underlying circumstances such as rocks, roots and underground springs, some ponds require more Sodium Bentonite than the recommended amount. Some ponds, due to poor site selection, improper design and poor construction, may never seal completely. Therefore, we cannot guarantee this product.